The UK’s leading feline welfare charity Cats Protection is releasing a recording of cats’ purring to ease the stress of Blue Monday (19 January) – often dubbed the most depressing day of the year. A cat’s purr is widely recognised as having therapeutic benefits for humans so can help combat the inevitable January gloom, brought on by cold weather, unpaid Christmas bills and failed New Year resolutions, the charity says. Furthermore, curling up with a feline friend is even known to lower blood pressure so cats really could be the purr-fect remedy for New Year blues. 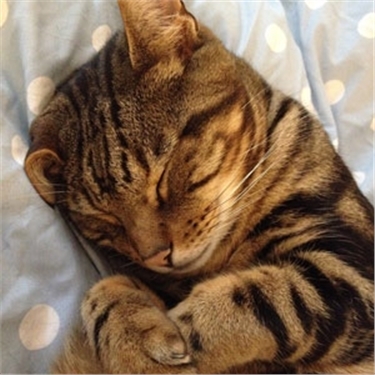 Cats Protection’s recommendation is backed up by research, carried out in conjunction with the Mental Health Foundation, which showed that owning a cat can help lift the spirits. The survey found that 87 per cent of people who owned a cat felt it had a positive impact on their wellbeing, while 76 per cent said they could cope with everyday life much better thanks to the company of their feline friends. • Cats purr by themselves as well as when around people. • Female cats are known to sometimes purr while giving birth. • Kittens are able to purr almost from birth and primarily purr when they are suckling. • The mechanism by which cats purr is elusive because there isn't a specific part of their body that produces the sound. It has been suggested that twitching the muscles in their voicebox, the larynx, rapidly dilates and constricts the glottis, causing air vibrations as they breathe in and out. • The loudest purring domestic cat was Smokey from Northampton who received a Guinness World Record Certificate after her purr was found to be 14 times louder than average. Those wishing to adopt a cat from Cats Protection can visit www.cats.org.uk or call the charity’s helpline on 03000 12 12 12 to find the nearest branch. For further information or an interview, please contact Cats Protection’s Media Office on 01825 741 911, at media.office@cats.org.uk ,or @CPMediaTeam on Twitter. 1. The study cited is based on a sample size of 621 with data which was collected between July and August 2011 via Mental Health Foundation’s website/social networking sites. The majority of respondents were women (83 per cent) aged between 26 and 55 (78 per cent). 2. Cats Protection is the UK’s leading feline welfare charity and helps over 194,000 cats each year through a national network of over 250 volunteer-run branches and 31 adoption centres. 4. Cats Protection’s registered charity number is 203644 (England and Wales) and SC037711 (Scotland). Founded as the Cats Protection League in 1927, the charity adopted the name Cats Protection in 1998. We ask that you use the name Cats Protection when referring to the charity in all published material.